Looking to set up your own clothing line? Perhaps grow it into an amazing online shop for art enthusiasts and shirt lovers? Then you’ll need to have awesome designs that are not just eye-catching but also perfect for both men and women. 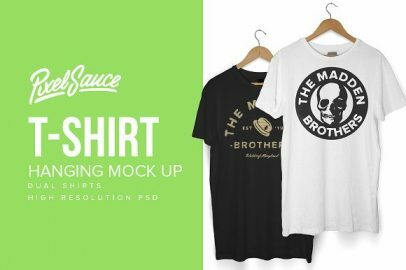 If you have Adobe Photoshop, you might want to consider downloading these T-shirt mockup templates. Containing more than 35 templates, this collection is available for FREE download. You can use them for both men’s and women’s T-shirt. And also for hoodies too! Are you planning to set up an online T-shirt shop? Then you’ll need to have awesome designs on your shirts. But if you’re having trouble with the visual graphics or perhaps with photos, getting those prints on your shirts may become a big challenge. Having T-shirt mockup templates can be very advantageous to you. Which is why we think this post can be helpful to your plans. 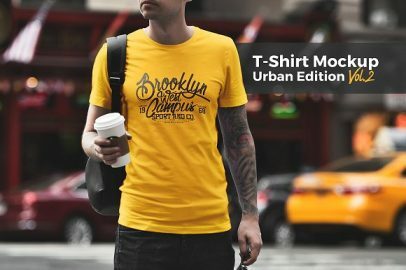 In this article, we compiled the more than 35 of the best T-shirt mockup templates that you can incorporate to your clothing line. With this set of templates, you won’t have to look for models to wear and pose with your T-shirts, jerseys, or hoodies. And no need to worry about the nuances of studio lighting or achieving the perfect appearance for you catalogue. With these T-shirt mockup templates, you just simply add your design. No more trouble with photography or having your shirts on hand for you to take a photo with them along with your model. But bear in mind that these FREE downloadable files may require you to have a basic understanding of Photoshop or similar image editing programs. So check out these amazing tools to help you generate the best T-shirt designs without hassle. You don’t have to create your prints and images from scratch. 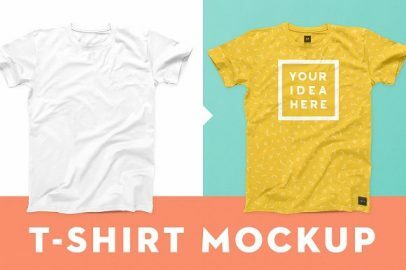 Simply look to these T-shirt mockup templates and get all the graphic design flexibility that you need to come up with eye-catching prints. We also have premium T-shirt mockup templates available for download. Before going into our collection of the best T-shirt mockup templates, you might be wondering why you should stick with these instead of your other alternatives. Well, for one, using these mockups is not only cost-effective but also highly practical. Think about it. You don’t have to spend for a top-tier camera to develop premium photos. And then there’s also the lighting. That costs money, whether you buy or rent them. Models too. You need to pay for their time. Developing the photos to achieve a catalogue-worthy look may also take time and effort. With photo editing, you need to sit on this in front of your computer for longer hours. But why though? You could spend your time more fruitfully? Instead doing all that photo editing work, you could do other things that could very well grow your budding shirt business. Which is why having these T-shirt mockup templates is good for an efficient use of your time, energy, and resources. Wondering what you’re getting when you have these cool T-shirt mockup templates at your disposal? With these awesome effects, you get a wide selection of designs and layouts that lets you generate images featuring your clothing line. Convenient and makes your job a whole lot easier. You can pick from the remarkable array of apparel designs and graphics without having to open your image editing software. This is perfect for those who aren’t used to Photoshop, photo editing, and what not. 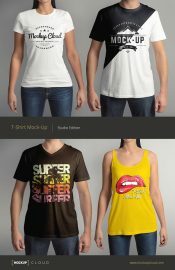 In this collection, you also get many styles of T-shirt mockup templates to choose from. This graphics design tool is very easy and simple to use too. It’s a great option for T-shirt business owners who don’t have access to or aren’t familiar with image editing programs. Simply upload your design and select which shirt or hoodie style you’d like to attach your graphics to. Now choose the color of your shirt or apparel. Rotate or adjust the image accordingly. And voila! You did all that from just using your web browser. Now wouldn’t these T-shirt mockup templates be great for your clothing business? It’s an easy and convenient way to print those designs on your apparel. Forget DSLRs, models, and an image editing kit. With this T-shirt mockup generator, you can quickly print products for your clothing store. Whether you need a template for men’s or women’s shirt, a onesie, or a cool hoodie, you got everything you need with this remarkable collection. 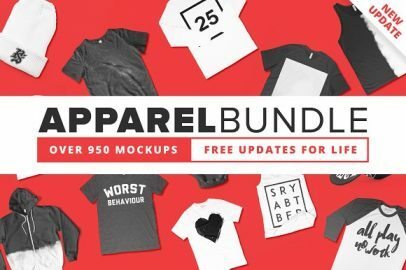 With over 35 of the best T-shirt mockup templates, it will be easy to make the images of your apparel collection to be true to life. These design layouts also make it easy to customize your color choices and styles. And what’s more, they’re extremely of good quality. Did we mention it’s FREE? You can download these amazing T-shirt mockup templates at no cost to you? Want to add a bit of fun to your clothing collection? You might want to expand your product line to include matching shirts for you and your pup. Perhaps broaden your clothing line to include unisex and athletics. With this amazing graphics design tool, you can create effects for a wide range of shirts, including tank tops and raglans. It’s so good it’s truly impressive. These T-shirt mockup templates are available in PSD format, so a little knowledge of Adobe Photoshop would be cool. If you’re looking for other mockups and design templates, you might want to check out our content. We highlighted FREE layouts in our other articles. Do you need mockup designs to create flyers? Looking for layouts for brochures? Need templates to make awesome postcards? Then you’ll love what we featured in our other blogs. Would you like to have more FREE mockups and templates? If you like what we featured here or in our other blogs, please don’t hesitate to get in touch with us.